The U.S. Chamber of Commerce has posted two billboards in front of the White House which declare America was built by foreign ‘Dreamers,’ not by native-born Americans, who apparently have no place in the billboards or in America’s society. Don’t American kids have dreams? [Silicon valley creators] David Packard and Bill Hewlett were not immigrants. Bill Gates wasn’t an immigrant. Tom Watson [founder] of IBM wasn’t an immigrant. Obviously immigration is an important part of America’s story, but it is just one part. The Chamber’s use of ‘dreamers’ to refer to migrants, and the deliberate erasure of 290 million Americans from their own nation and history was posted as business leaders arrived in town November 15 to demand that Congress provide a no-strings amnesty for at least 3 million illegal immigrants, plus million of their foreign relatives, no matter the financial and civic cost to American families and American voters. “America. 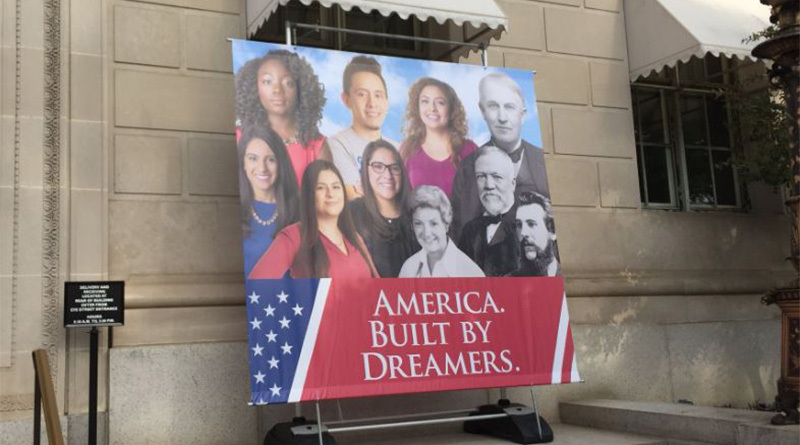 Built by Dreamers” banners outside @USChamber. The business groups are demanding the extra immigrant workers and employers, even though new data shows that the migrants dubbed ‘dreamers’ by Democrats have college graduation rates that are one-tenth of similar-aged Americans’ college graduation rate. However, any infusion of new immigrants provides Chamber companies with millions of extra workers to lower wages rates. The immigrants also serve the Chamber as millions of government-dependent customers. For example, Breitbart News estimated that an amnesty for 3 million ‘dreamers’ would require taxpayers to provide $115 billion subsidies via Obamacare to myriad health-care companies. In practice, the taxpayers’ costs will be far higher because new immigrants can use the nation’s chain-migration law to being in many of their foreign relatives, regardless of their skills, ideology, age or health. For example, the National Academy of Sciences reported in September 2016 that legal and illegal immigrants cost state and local taxpayers $57 billion per year, not counting huge additional federal costs. The same report shows that immigration forces down Americans’ wages down by 5.2 percent, and annually transfers $500 billion in payroll up to employers and investors. That is all gravy to business groups, which gain from a larger population and national economy, especially if there is no growth in employees’ per-capita salaries. The fuss over the DACA amnesty, however, is intended to draw attention from a more important fight. Business groups are using the demand for a DACA amnesty to distract media and congressional attention from President Donald Trump’s popular, pro-employee immigration principles. If Trump signs a congressional no-strings amnesty for the DACA recipients, he will have abandoned his election-winning immigration principles. That strategic defeat will allow lobbyists to push Congress to next raise the supply of young white-collar visa workers — such as H-1B workers, OPT graduates and L-1 visa workers — who can help lower salaries for middle-aged American tech workers and of legal immigrants. Any increase in the white-collar labor supply is likely to reduce labor costs, freeing up revenues to spike profits and investors’ returns. Already, the various visa programs keep 1 million foreign white-collar workers employed in varied work-sites at universities, fashion companies, engineering firms, computer firms, pharmacies, hospitals, and in the back-office cubicle farms created by banking and insurance firms. 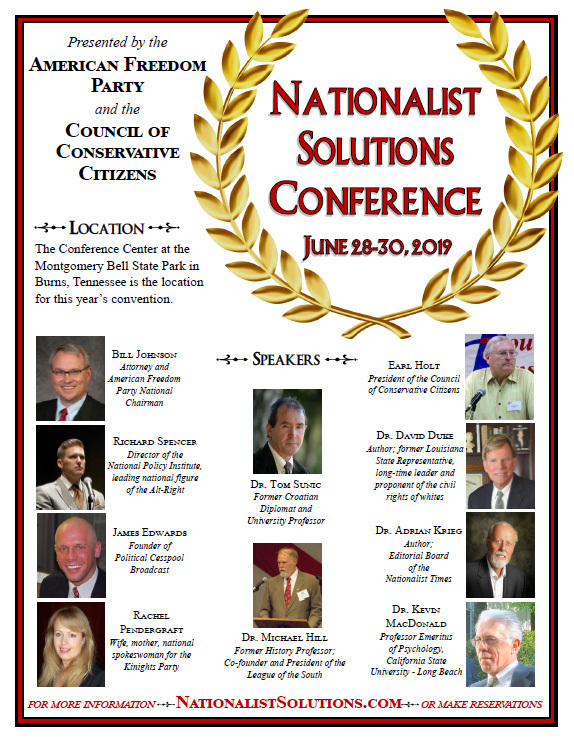 The campaign is also aimed at reporters, few of whom will notice the exclusion of Americans because most reporters embrace the myth of America as a “nation of immigrants,” not a nation of Americans, Krikorian added. Industry-skewed “nation of immigrants” polls show that Americans want to welcome migrants. But “fairness” polls show that voters put a much higher priority on helping their families, neighbors, and fellow nationals get decent jobs in a high-tech, high-immigration, low-wage economy. That political power of that higher priority was made clear in November 2016 when Americans put Trump in the White House. The billboard was endorsed by the FWD.us group of investors, whose founders include Facebook’s Mark Zuckerberg. Four million Americans turn 18 each year and begin looking for good jobs in the free market. But the federal government inflates the supply of new labor by annually accepting 1 million new legal immigrants, by providing almost 2 million work-permits to foreigners, by providing work-visas to roughly 500,000 temporary workers and doing little to block the employment of roughly 8 million illegal immigrants. The Washington-imposed economic policy of mass-immigration floods the market with foreign labor and spikes profits and Wall Street values by cutting salaries for manual and skilled labor offered by blue-collar and white-collar employees. It also drives up real estate prices, widens wealth-gaps, reduces high-tech investment, increases state and local tax burdens, hurts kids’ schools and college education, pushes Americans away from high-tech careers, and sidelines at least 5 million marginalized Americans and their families, including many who are now struggling with opioid addictions. The cheap-labor policy has also reduced investment and job creation in many interior states because the coastal cities have a surplus of imported labor. For example, almost 27 percent of zip codes in Missouri had fewer jobs or businesses in 2015 than in 2000, according to a new report by the Economic Innovation Group. In Kansas, almost 29 percent of zip codes had fewer jobs and businesses in 2015 compared to 2000, which was a two-decade period of massive cheap-labor immigration. like the Maryland workplace killer this should be worthy of national coverage given it’s relevance to the current issue. But the mediots kill it. Can you imagine what they would do with this if they could blame the exact same crime on whites?